Being a child of the 70/80's, I can say that TV molded most of my younger life. Not in a way that the VCR generation, with their Disney movies, but in a way that we can quote a Looney Tunes cartoon ("which way did he go, George.") or understand that violence on the TV was just that. We didn't go out and push each other off a cliff like Roadrunner and Coyote. That being said, with Sesame Street, we had the TV turned to our local PBS station quite often. Which brings me to the subject of this post, growing up, I (unfortunately) didn't care for Julia Child. I found her shows boring and uninteresting (please, before you come to a judgement, finish reading! ), but I was 9 in 1980, so I was heavily influenced by my parents viewing decisions. A few years later, I did take to watching Yen Can Cook. And found a few techniques I still use, daily. Fast forward 35 years into the future, and I am truly sorry for all of the history I missed, right in front of my eyes. Julia, I have learned to love and respect you more now than ever! You were truly so far a head of your time. The first thing that brought Julia into my life was watching Merrill Streep in "Julie and Julia". I was so enraptured. I have seen that movie at least 6 or 7 times. In addition to the movie, I have read every biography I could get my hands on about her life, even if it's just a different perspective of the same story, I find it so very interesting. Even to the point of buying a copy of Mastering The Art Of French Cooking, granted I have yet to make anything out of it, but I feel it makes me closer to Julia. Of course, tonight's recipe is featured in Vol. 2. 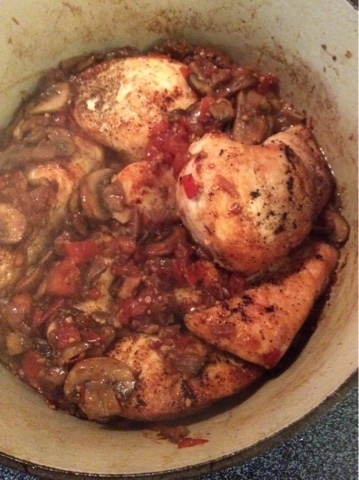 So, the second part of this post is that last week , I decided to make a French chicken dish for dinner. I've tried Coq Au Vin, and a few others, so I wanted something different. 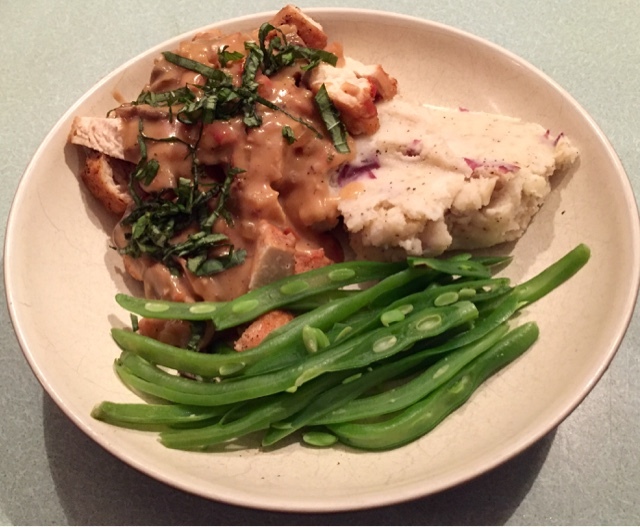 That's when I came across this delicious dish, even rated "good" by my husband! (and you all know that that's close to 5 stars in his book, the only thing higher is, "can you make this again") It's a classic dish, with lemon, wine, mushrooms and all the other cast of characters. Check it out, it's really not that intimidating. 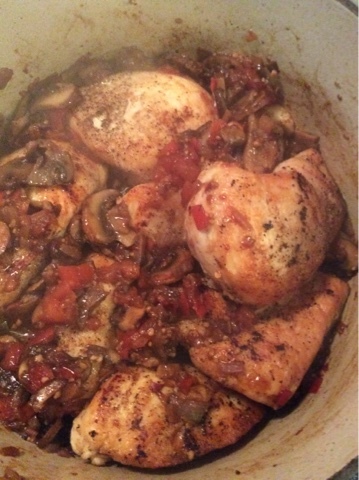 Chicken Chasseur, or Hunter’s Chicken, is a simple French country meal. A hunter would have brought back his game and maybe a few mushrooms he’d found along the way, and his wife would have thrown the lot in a pot with some wine and simmered until tender. It’s ready in less than an hour and cooks all in one pot! 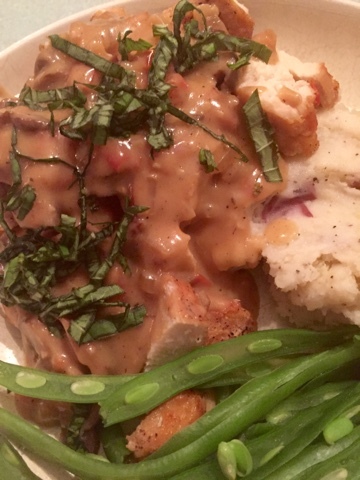 I served it with mashed red potatoes, and Frenched green beans. 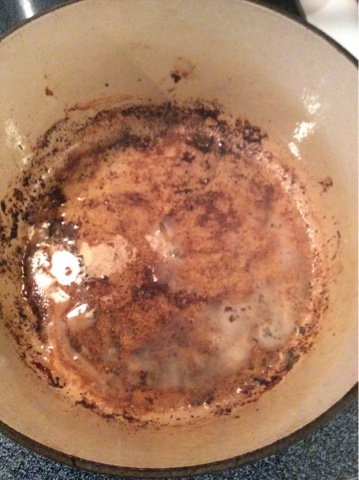 * In a large skillet over medium heat, melt your butter and oil. 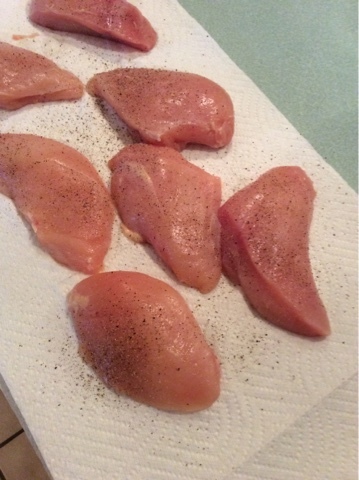 Pat your chicken breasts dry with a paper towel and season both sides with salt and pepper, liberally. When the butter starts to foam, add in your chicken and sear on both sides (about 3-4 minutes per side) until a golden brown crust forms. * Remove the chicken from the pan and place on a plate. 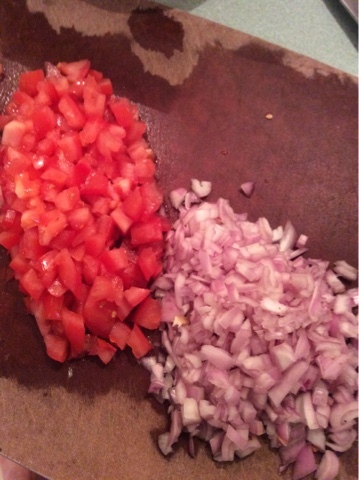 Add in your shallots and garlic to the pan and saute for 2 minutes. 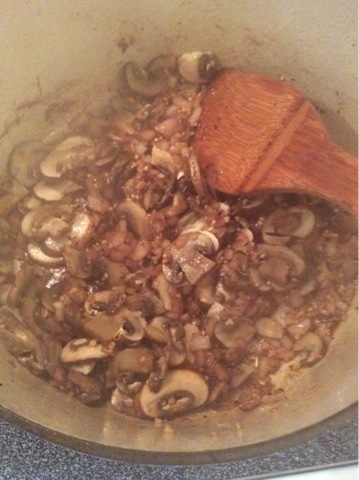 Add in your mushrooms and tomatoes and saute about 8 minutes over a medium heat, stirring frequently. * Return the chicken to the pan and add in your cream, wine, stock, and lemon juice immediately. 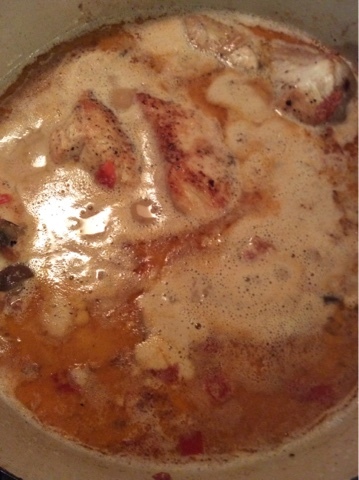 Bring the liquids to a boil, then reduce to a simmer and cook until the chicken has cooked through. 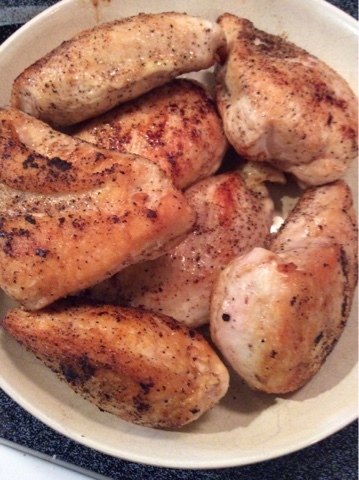 Remove the chicken again from the pan and place on a serving platter, and stir in your flour, cooking the liquid another 3 minutes to thicken. Taste and season with salt and pepper. * Pour the sauce over the chicken and sprinkle the fresh basil on top. Serve hot. Chicken, back in the pool!